Besides taking a look at different games and comparing them, from time to time I’d also like to share inside looks at the translation and localization process. Mostly for games, but maybe we’ll occasionally look at other media too. This time, I want to focus on something known as “control codes”. I use this term a lot in my more in-depth articles, so let’s take a look at what exactly control codes are! Well, first off, I guess I should mention that “control codes” can go by a lot of different names, but it’s the term most commonly used among game hackers and fan translators. Other terms I’ve come across are “script codes” or even just sometimes “non-text data”. Basically, when you’re translating a line in a video game’s script, that line obviously contains text. So you translate it. But sometimes there’s other stuff mixed in with the text that modifies – or “controls” – the text in some way. Hello, [PLAYER_NAME]! How are you? When writing or translating a game, this is what a line would look like in the actual script file. But when you’re playing the game, the programming will replace the [PLAYER_NAME] control code with whatever’s supposed to go there. Simple enough, right? As you can see in this example, [name00] is replaced in the game with “Byuu”, which was the name the player chose. If you look closer, you’ll see that there’s not just a name control code in that line, but some text formatting control codes too. In this particular example, the [cr] code is used for line breaks, and the [end] code denotes the end of a line or scene. In this example, [nl] denotes a line break, character names have [Character ##] control codes, text color can be changed with the [colour ##] code, and there’s even a [pause] control code that pauses the text until the player presses a button. Already, we can see that control codes can actually control quite a lot of a game’s text and a game’s flow! 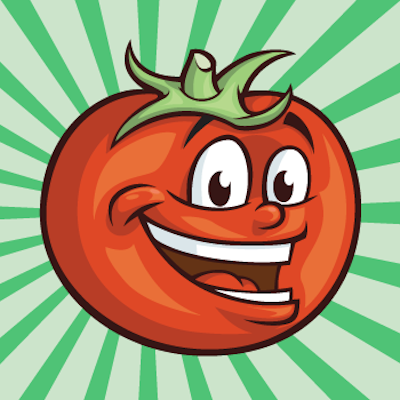 Some games have more control codes than others – it depends primarily on the developer and the type of game in question. Some games have almost no control codes, while others have so many control codes that it’s pretty much a nightmare. For example, MOTHER 2 and EarthBound have extremely complicated control code systems… They’re so complex, in fact, that I’d call them scripting languages instead. I’d say 90+ percent of the game is done entirely using control codes. It’s insane. Here’s a sample from just a tiny scene! The game’s complex control code system is a big reason why so few translations into other languages exist. 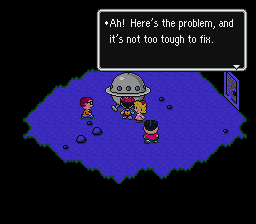 It’s also why my MOTHER 1+2 translation patch doesn’t really do much to the MOTHER 2 side of things. Anyway, as a translator, it’s important to translate everything properly while avoiding as many typos and such as possible. On top of that, though, you have the added pressure of not screwing up any control codes. The bigger the script, the easier it is to mess up something on accident. And, worst of all, if you do mess something up it won’t be obvious until after your project is long finished! The original translation had a control code goof of its own, again relating to Kain! In this scene near the end of the game, Kain’s name is accidentally used instead of Cecil. This is especially jarring since Kain not only isn’t in the party at the time, he’s actually on the bad guys’ side! 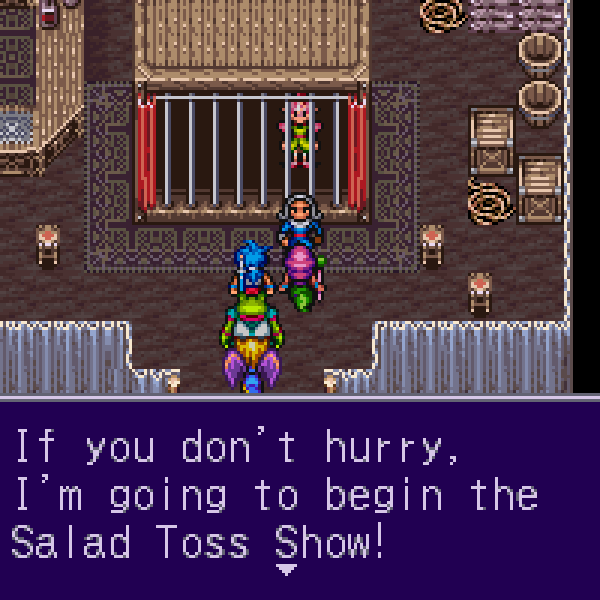 Good ol’ Breath of Fire 2 is infamous for its wacky translation job. It commits every mistake in the book, including control code problems! In this case, it looks like the translator didn’t include the first bracket and/or parenthesis, which made the game think the stuff inside was normal text rather than a control code. So, that’s a quick look at control codes, what they do, and the problems translators face when dealing with mountains of text. In future updates I’d like to cover other topics of this nature, like script formats, translation tools, super-tricky typos, constantly-changing source files, deadline woes, and more. I mentioned the Lufia 2 “Maximum” glitch in a previous post; I’ll have to look into getting a screenshot of it in action. Bless them, though. I have seen cases where it just assumes that the ordering can be consistent between languages and no control codes are used. Maddening! If EarthBound’s control codes were so complicated, what were Mother 3’s like? Mother 3 was pretty simple and standard, although it did have a few unique oddities of its own. You can get a general idea from this: http://earthboundcentral.com/m3script/ Although I scrubbed out most of the color codes, line break codes, pause codes, etc. before uploading it all. The playable epilogue in Lunar 2: Eternal Blue Complete has a few instances of showing the wrong character portraits in dialogue boxes, leading to the images of Ruby and Hiro directly addressing THEMSELVES. “Do you remember the first time we found this room, Ruby? We were so green!” says Ruby. “Ha! Look, Hiro! We did it! Now we can get inside!” says Hiro. Oh, hey, LunarNET’s screenshots are back up. This conversation actually goes on for several more text boxes, with Ruby eventually responding to stuff Hiro is supposed to be saying. I actually genuinely don’t know at what point the the speaker stops being mistake-Ruby and starts being actual-Ruby. Straightforward mistake. The response (http://www.lunar-net.com/ebc/screens/10/EBC4834.JPG) was probably supposed to be Hiro’s line, but that’s unknowable for certain. Ooh, cool, thanks! It’s been a good 10+ years since I played that myself, so I don’t remember much at all. That looks like a goofy, confusing mix-up though! One more reason for SegaCD supremacy! All personal bias aside, Eternal Blue Complete’s US release had a surprising number of errors for a Working Designs release(say what you will about liberties taken, but they were usually really good about quality control). Lucia’s spell names were all scrambled, and there was even a section in the white dragon cave where Nall gives instructions to solve a puzzle that doesn’t exist in the Playstation version. Wow, really interesting stuff!! Mother 2 gave me a headache just looking at it though… was Mother 3 just as complicated, or even more so? Mother 3 was pretty normal and standard for the most part. I think it might’ve been because it was developed by a completely different team that handled the game’s design/implementation with a totally different approach. Alright, WHY does EarthBound have that many those flags? I know that certain flags are required for ellipse delays and certain word-scroll timing and maybe the Mr. Saturn font, but boy that’s a lot of hexadecimal numbers. Is this the same deal in MOTHER 2? Pardon, instead of “ellipse” I meant “ellipsis” [ … ]. From what I understand, the cutscene animations in EarthBound are handled by the control codes within it’s text script. That is why Mato refers to EB’s control codes as a script language, and it also explains why there are so many control codes in that scene. Yeah, Mother 2 has crazy codes too. They’re slightly different from EarthBound’s for some reason, but I’m not sure why. That’s a big reason why you can’t just plop EarthBound’s script into the Mother 2 ROM and have anything work. Here’s some fun from Duel Savior. @t forces text display speed. ms I think. @w is an output delay wait. @g declares one of their text special emoticons. ^ are post processing that I added so it could linebreak accurately. I like how you used a screenshot from Byuu. Did he work on the Bahamut Lagoon translation? That guy’s a genius. bsnes/higan is a work of genius. And art! 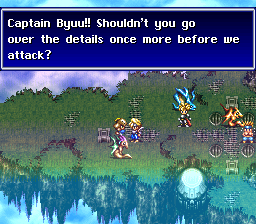 Actually, Byuu is the default name of the character in Bahamut Lagoon, and it’s partly where bsnes byuu got his name. But I totally agree, he’s a crazy genius! He worked on his own unfinished translation patch. 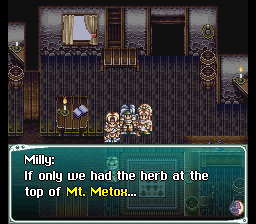 I would love to see more commentary on the Breath of Fire 2 translation in the future. Thirded. I’ve found a number of interesting tidbits from even the original BoF translation in my own attempts at retranslating that game, and since the second game’s translation quality was visibly worse, I’d be interested to see what might be hiding under its surface. This is some fascinating stuff. I read a Let’s Play of Mega Man Battle Network 4 and it was full of moments with wrong portraits. Then again the game had dozens of typos and TWO different game-breaking bugs, one outright made the GAME unusable. Makes portraits fails look okay in comparison :p.
In Mega Man 7, the ending has Mega Man about to shoot and kill Wily. Wily tells Mega Man that a robot cannot kill a human according to the laws of robotics. In the Japanese version, Mega Man hesitates with a “…”, but in the English version, he says “I am more than a robot! Die Wily!”. The reason I bring it up here is that the text crawls reeeaaallly slowly during this line. It must be because the control code for text speed is still set to a slow speed to match the original “…” line. Harvest Moon: More Friends of Mineral Town has a jarring one where a typo for a control code has a character referring to you as “palyername”. And, due to the script not being read, she says this with a straight, generic face. When I came across it, I cracked up laughing. I had gotten jack squat for my in-game birthday that year, and to top it off the script wasn’t even being properly coded. If you search up that line of dialogue on Google, you can see what some other people had to say about it. Dang it, it cut the script out! For the Nintendo DS, there’s SNK vs. Capcom: Card Fighter’s DS. There are some typos and false information, but I recall seeing a cutscene where a character named Miyuki (I think that was her name, I can’t remember) who would mention the name of her deck, and in one cutscene, instead of the name of the deck, it said [deck_name]. That’s just one of many mistakes with the script. Someone was really lazy when it came to translating that game. That game had a wild number of script errors, including one in the “second quest” that was unavoidable and caused a hard-lock. They made a revision that fixed the error, but didn’t recall the existing stock. Guess who found out there wasn’t actually a recall and he’d bought version 1.0 about two weeks after the exchange program ended. Even the recent games have a few… issues. The most recent 3DS game (A Tale of Two Towns) has a bad one if you try to talk to a specific character on your birthday. The control code for formatting her face sprite slips into the text box! So instead of saying “Happy birthday!” to you with a “cheerful” face sprite, she has a neutral face sprite and the code telling her to show a “cheerful” sprite slips into her birthday message. When it comes to really crappy control code mistakes, Natsume is king. When I play Final Fantasy VII, I usually rename Aeris to Aerith, since that’s her official name in all the newer material. However, at some points, the name “Aeris” pops up, since apparently the name was hardcoded into the script instead of using the corresponding control code. I should note that sometimes I play the (horrible) English translation and sometimes I play the (horrible) German translation (which seems to be based on the horrible English translation as well), but I don’t remember if the error exists in both translations or only in one of them. What fascinates me the most with control codes is the simple line break one: The games that do or don’t do automatic line breaking are sometimes really not those you’d expect! Also, games that don’t do it are probably very annoying to translate. That’s a leaky abstraction that shows you how constrained you are by the text boxes. Control codes are both your best friend and your worst enemy. Especially when they’re written in a lower-level script (i.e. closer to computer code, like a lot of the binhex codes shown above from Earthbound) I’m doing some indy game development, and I misstyped a control-code in the FIRST AREA, and it was months later, after myself and more than a few testers had gone over MANY areas with a fine-toothed-comb, that someone actually caught the error because it was a dialogue that only happened if several non-optimal conditions were met. I don’t remember where, but I recall there being a sign somewhere in the overworld of Alundra where the text screws up somehow when you read it. Oh man. I can only imagine what the raw text for Paper Mario series dialogue looks like. That series did some crazy stuff with it. When I playing and finished Phantasy Star 2. I noticed some control code problem. As the infamous line when the party talks about the underwater climate control station and second line is cut off. https://tcrf.net/Phantasy_Star_II#Cut-Off_Line. But also at near end of the game. When party talks with Lutz before Lutz send them to the space ship. This scene became a bit messed up with engrish and another weird going on. In my version text became also a bit engrish and text became warped and wrote texts over dialogue box and the music slowed down. They also got Yes/No messed up so yes means no and no to yes. I thought first this game gonna hangs up and breaks down and thinking about could not complete the game. But game finally kept onto the last palace at space ship. Legend of legaia (spanish) has a map with many control codes messed up, text out window too. I’ve heard that the localisers of the 3DS Pokémon Mystery Dungeon games weren’t allowed to add anything other than text, so I figured that was why the protagonists of both games have fixed genders (except in the English translation of Super), and why they removed the female Pikachu model in translations of Gates to Infinity: they weren’t allowed to add control codes for gender. I don’t know how true this is, but evidence for this theory is that there’s an icon in Super with Japanese quotation marks on it in all versions.